Julius Plücker, 1823 Philipps-Universität Marburg Rudolf Lipschitz, 1853 Universität Berlin Christian Ludwig Gerling, 1812 Georg-August-Universität Göttingen. 1 Julius Plücker, 1823 Philipps-Universität Marburg Rudolf Lipschitz, 1853 Universität Berlin Christian Ludwig Gerling, 1812 Georg-August-Universität Göttingen Gustav Dirichlet, 1827 Rheinische Friedrich-Wilhelms-Universität Bonn Martin Ohm, 1811 Friedrich-Alexander-Universität Erlangen-Nürnberg Karl Christian von Langsdorf, 1781 Universität Erfurt Carl Friedrich Gauss, 1799 Universität Helmstadt Simeon PoissonJean-Baptiste Fourier Joseph Louis Lagrange?Johann Pfaff, 1786 Georg-August-Universität Göttingen Abraham Gotthelf Kaestner, 1739 Universität Leipzig Christian August Hausen, 1713 Martin-Luther-Universität Halle-Wittenberg Johann Christoph Wichmannshausen, 1685 Universität Leipzig Otto Mencke, 1665, 1666 Universität Leipzig ? Leonhard Euler, 1726 Universität Basel Erhard Weigel, 1650 Universität Leipzig Gottfried Wilhelm Leibniz, 1666 Universität Altdorf Johann Bernoulli, 1694 Jacob Bernoulli ? Rafe Donahue, 1992 Colorado State University Richard Alan Davis, 1979 University of California, San Diego Peter J Brockwell, 1967 Australian National University Murray Rosenblatt, 1949 Cornell University Mark Kac, 1937 University of Lwów Wladyslaw Hugo Dyonizy Steinhaus, 1911 Georg-August-Universität Göttingen David Hilbert, 1885 Universität Königsberg C. L. Ferdinand Lindemann, 1873 Friedrich-Alexander-Universität Erlangen-Nürnberg C. Felix Klein, 1868 Rheinische Friedrich-Wilhelms-Universität Bonn ? Fortunate to Stand on the Shoulders of Giants Rafe Donahue’s Mathematical Family Tree The Mathematics Genealogy Project, a service provided by the Department of Mathematics at North Dakota State University, intends to compile information about all the mathematicians of the world, certainly a daunting task. As of 15 October 2005, the database held 91,505 entries. I was fortunate enough to track my ancestors back over three hundred years. Erhard Weigel has approximately one-third (32,885) of all the descendants in the database; however, all come through Lagrange. Poisson and Fourier both have large numbers of offspring, due to their joint tutelage of Dirichlet. In fact, all of Fourier’s descendants in the database come via Dirichlet (22,655); Poisson picks up an additional 12,000 through Michel Chasles. (Note that the numbers don’t necessarily add up due further joint descendants.) The other main branch, that started by Mencke, contains roughly one-third (30,557) of all the entries as well. All of these entries can be attributed to Kaestner. Pfaff carries over 29,000 of Kaestner’s progeny, most of them carried by Gauss (29,116), although Möbius (known for his one-sided strip) carries over 1100. Certainly, this concentration of so many descendant mathematicians on so few ancestors is not unexpected, as the careers of the masters is well documented. The ability to follow the lines of less prolific mathematicians is much sharper in the 20 th century. For example, Klein is credited with nearly 22,000 descendants and 55 students, 17 of whom themselves have off- spring. 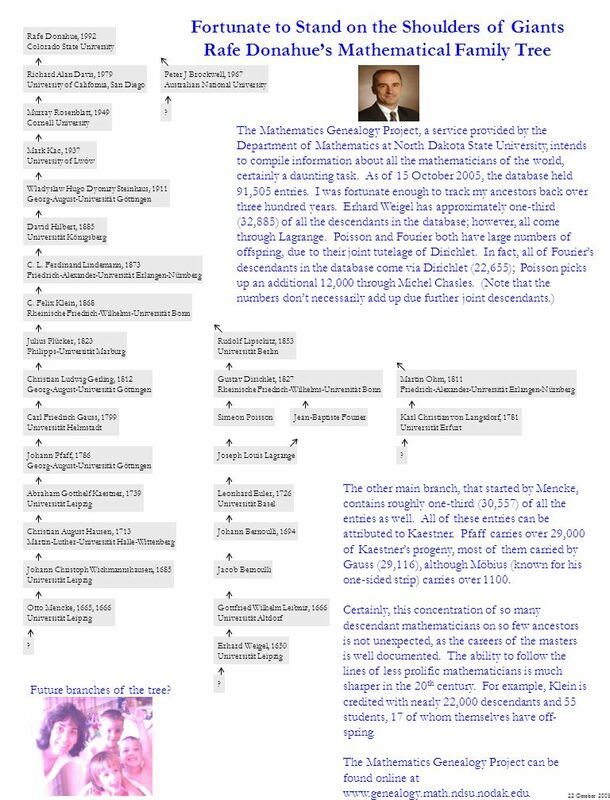 The Mathematics Genealogy Project can be found online at www.genealogy.math.ndsu.nodak.edu. 22 October 2005 Future branches of the tree? Herunterladen ppt "Julius Plücker, 1823 Philipps-Universität Marburg Rudolf Lipschitz, 1853 Universität Berlin Christian Ludwig Gerling, 1812 Georg-August-Universität Göttingen." Reading for inference. Hat Silvana Koch-Mehrin abgeschrieben? Immer neue Fundstellen in der Doktorarbeit der FDP-Spitzenfrau deuten darauf hin. Sie selbst.